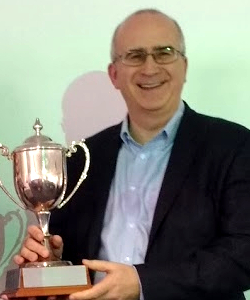 Jeremy Lonsdale was presented with the Brooke-Lambert Trophy for the Statistician of the Year at the ACS’s AGM in March 2019. As a young man, Jeremy Lonsdale was able to sift through the scrapbooks of his first cricketing subject: Brigadier General RM Poore, The Army’s Grace, published by Spellmount in 1992. Both that choice and his later work have shown that Jeremy has the ability and the self-confidence to go wherever his interest in history takes him. For his recent works published by the Association he has returned to his home county. His history of Yorkshire between 1822 and 1893, A Game Taken Seriously: The Foundations of Yorkshire’s Cricketing Power, was described by the British Society of Sports History’s reviewer as ‘a considerable achievement’, and made the final shortlist for that Society’s Lord Aberdare prize for sports books published in 2017. In 2018, his biography of the 19th-century Yorkshire all-rounder Tom Emmett was the 50th volume in the Association’s Lives in Cricket series. He takes Yorkshire cricket’s story further in a work due out shortly, A Game Sustained, covering 1914 to 1920. Jeremy finds the time to watch Hull football club as well as Yorkshire. His works are impeccably researched, sourced and referenced, as you would expect from an auditor. For what he has written and the way he has written it, he is a deserved choice for the Brooke-Lambert Trophy.